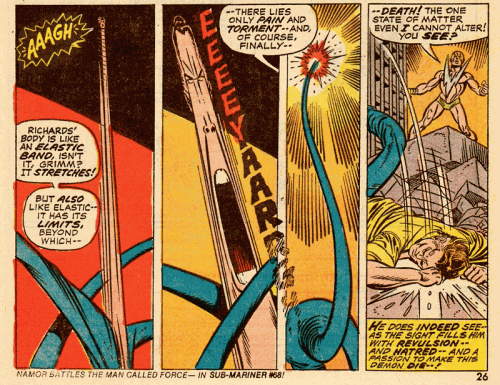 Vengeance of the Molecule Man! Welcome to another installment of The Dollar Box, where I look at comics with a cover price of a dollar or less. After previously spotlighting issues of Strange Tales (1966), The Amazing Spider-Man (1963), and the Silver Surfer (1968), this month I look at modern comic book — Marvel Two-In-One #1, from the futuristic year of 1973! This issue carries a cover price of .20, and while it won’t require a bank loan to acquire today like those other books I’ve covered, you should still expect to pay $30-$40 for a copy in decent condition. To be fair, Marvel Two-In-One #1 isn’t a terribly significant issue — there are no first appearances or lasting pop culture influences in this book. But it is a solid Bronze Age comic book tale, told by two masters of their craft, and it has more than a little sentimental value for your humble narrator. Marvel Two-In-One grew out of a two-part run in Marvel Feature, copying the success of Marvel Team-Up, where Spider-Man was paired with a guest-star-of-the-month for what was usually a single-issue adventure. For Marvel Two-In-One, the headlining character would be Benjamin J. Grimm, better known as The Thing of the Fantastic Four, an outsized personality more than ready to step from the ensemble of his original book and star in adventures of his own. Two-In-One would never be as popular or successful as Marvel Team-Up, but the book had its moments, and in its hundred-issue run would feature work by John Byrne, George Perez, and a young Frank Miller. Author Steve Gerber spent little setting the tone and format for the new book — though as was often the case with Gerber, he didn’t take an easy route. 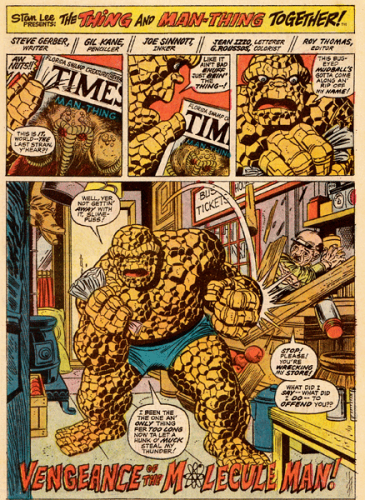 The cover of the book promises “Monster vs. Monster … while a world trembles!” and most readers would have been happy to see Ben and his inaugural co-star, Man-Thing, pound the stuffing out of each other for nineteen pages. But Gerber wasn’t interested in what was easy. He wasn’t even interested in superheroes throwing punches at each other, and so that awesome action promised on the cover amounts to a scant half-page in the finished story, as the Thing punches through the Man-Thing, and comes away with a fist-full of slime and an appreciation of his foe’s hellish existence. What do we get for the rest of the issue? Characterization! Later authors of Two-In-One would tie themselves in knots contriving to bring their characters and bad guys together, but Gerber goes right at it, having Grimm get a mad on after reading tales of a “Man-Thing” stealing Ben’s good name in the Florida swamps. Two pages later and Ben’s on a southbound bus, still fuming. 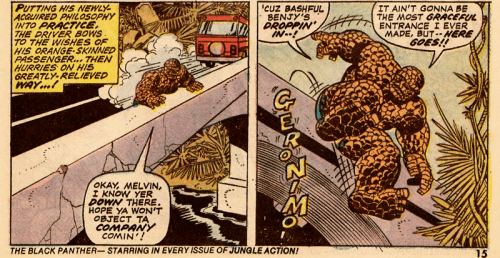 Now of course it is ridiculous that Ben would ride a bus to Florida to reclaim his naming rights from Man-Thing …but in a Steve Gerber world populated by talking ducks and an encounter-group masquerading as a superhero team called The Defenders, this kind of behavior was perfectly sane. More important — it was human, and it was in writing the human dimension of his characters where Gerber excelled. Steve looked past the orange rock monster in blue trunks and saw the insecure man within, and with this deft bit of characterization preyed on that man’s insecurities to both set up his story and give us affectionate insight on our hero. With Ben lost in reverie, the action shifts to some distant planet, where the Molecule Man breathes his last, but not before inspiring his son to seek vengeance on the Fantastic Four. A new Molecule Man emerges from a bath of pseudoscientific radiation, now able to extend his control over matter itself to living flesh. Molecule Man skips the bus, instead turning his own cells into “living magnets” that will draw him to wherever the Thing may be, and is surprised to find himself in a Florida swamp, and even more surprised to run into Man-Thing, who curiously follows the villain as he stalks away in disgust. From there it remains only to get Ben into the action, again in the most direct way — Ben intimidates his bus driver into making an unscheduled stop, and jumps from an overpass right into the path of the Molecule Man. It’s all very pat, and more than a little weird, sounding almost like one of the Say What?! features at StashMyComics. But Gerber makes it work, charming us with Ben’s cranky speechifying and keeping the story moving fast enough that we don’t really have a chance to raise an objection. Ben doesn’t stand a chance against a foe who can control the building blocks of matter. So quickly does Molecule Man gain the upper hand that he elects to transform both Thing and Man-Thing back to their original human forms, that they might be “naught but impotent observers” while he destroys the Fantastic Four. Before long the Molecule Man is back, his plan to kill the rest of the Fantastic Four undone by his malfunctioning wand, but he picks a proxy out of the crowd in a nearby town, transforming an innocent bystander into a Mr. Fantastic look-alike, then stretching the poor soul’s body until it snaps in half. 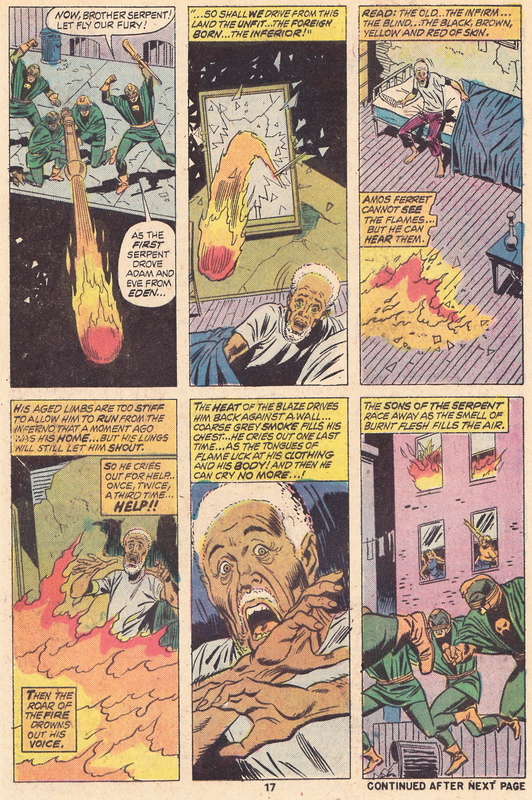 It’s a shocking bit of violence, out of character with the rest of the story, but it is vintage Gerber, who delighted in flipping from surrealism to realism from panel to panel, never afraid to raise the stakes or splash some blood if it drove home the depravity of his bad guys (a year later, Gerber would have racist Sons of the Serpent scumbags burn an old man to death in a tenement building in the pages of The Defenders). Ben is taken aback by this murder, and things start to happen fast. Possibly for no real reason other than that he is running out of pages to complete his tale, Gerber has the Molecule Man change Ben and Sallis back into their monster forms, just in time to throw a couple punches at each other, before putting paid to our villain when he loses the handle on his wand. And then it is over, with Ben stalking off to next month’s unrelated adventure with the Sub-Mariner, and Man-Thing returning to his swamp, bereft of identity or even memory of his brief reprieve. Marvel Two-In-One #1 is an admittedly slight tale, thin on action and thus not taking best advantage of penciler Gil Kane’s skills, but I still like it, mostly for Gerber’s ear for dialogue, masterfully expressed through our rough-hewn hero. A comics writer of rare intelligence, Steve Gerber always brought his A-game, even when he was making it up as he went along, and his work is among the best produced during the “anything goes” period when Roy Thomas took over from a distracted Stan Lee as Marvel’s Editor-In-Chief. Marvel Two-In-One #1 isn’t the greatest book of its era — its not even among the best books Steve Gerber would ever write — but I do think it’s the top single issue of Marvel Two-In-One, whatever its faults (and here is my review of the other ninety-nine issues of Marvel Two-In-One!). But for one of my favorite writers, writing one of my favorite characters, kicking off one of my favorite “guilty pleasure” superhero series, I find it irresistible, particularly given my own fleeting personal experience working with Steve Gerber. Should you find it in a dollar box of your own, I hope you will give Marvel Two-In-One #1 a shot …and if you can’t find a copy of your own, a little bird tells me you can take a peak over at the always-groovy Mars Will Send No More site! IN THREE WEEKS: #115 The Purge! Posted on October 23, 2013, in The Dollar Box and tagged Gil Kane, Man-Thing, Marvel Two-In-One, Steve Gerber, Thing. Bookmark the permalink. 9 Comments. This is both obscure and insightful at the same time! How do you come up with such topics? My life has been a productive waste! One thing is for sure; when a comic book stars Man-Thing and The Thing, it is gonna be hard to mess it up, especially with Gerber at the helm. The titular similarities basically demanded this team up! 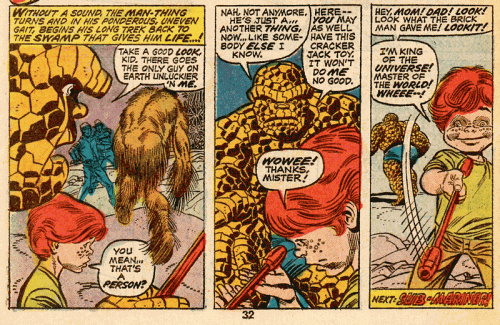 I like how Gerber goes right at it and has Ben get outraged that the Man-Thing stole his name … it makes no sense at all, except in Gerber-world, which was a wonderful place to visit. I miss him! Anyone who truly loves comics misses him.